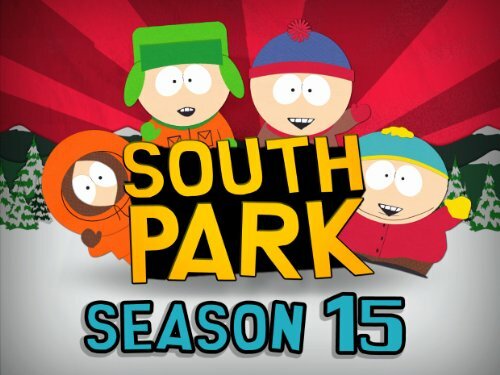 (S1501) The loveable foul-mouthed kids from South Park are back for their 15th season on Comedy Central. And if you think creators Matt Stone and Trey Parker are running out of ideas you would be sadly mistaken. While they come up with a lot of wild and crazy ideas of their own, it inevitably ends up being a commentary on our society mixed with pop culture references. In the meantime, Kyle is playing with his new iPad, when suddenly three men from Apple show up. They are there to enforce the terms of the new iTunes user agreement that he clicked on without reading. Immediately Kyle runs away from the men trying to kidnap him and goes to get help from Stan and the gang. But they don’t know what he is talking about. They haven’t seen the new user agreement and wonder why Kyle could be so dumb as to not have read it. Everyone reads it before they agree to it. While Kyle is getting dragged off by the mysterious men, Cartman is at Best Buy trying to get his mom to purchase the new iPad. But when she starts looking at a cheaper non-Apple product he throws a fit in the store, and goes as far as dropping his pants and screaming at her, “If you want to f--k your son so bad, go ahead, mom! F--k me! F--k me!” Needless to say, he doesn’t get anything. After finally reading the updated iTunes agreement, Stan suggests going to the highest authority on the planet, The Geniuses. No, it’s not a government think tank or anything like that. The Geniuses are the nerdy support staff in the Apple stores. If anyone can get Kyle out of the contract it’s them. As they look for a way to save their friend, the operation has taken place and Kyle finds himself the middle segment in the HumancentiPad. From this point on it’s a constant barrage of disgusting humor as the jokes are more about him being subjected to the first segment constantly crapping in his mouth. Cartman still hasn’t given up on his dream of a new iPad, and after a guest appearance on Dr. Phil telling him how he was abused by his mother F-ing him all the time, he is rewarded with a present for all of his suffering. He will become the first person to own the new HumancentiPad. Eventually the Geniuses find a way for Kyle’s father to break his contract. But in order to do so, he must create his own Apple account, change it to a family account and then retroactively deny Kyle’s approval of the latest agreement. He can do that or they can get him a new replacement model. Overall this is the most disgusting and disturbing episode that they have produced. But you can’t give the two South Park creators the full credit for that since the idea came from “The Human Centipede” film. But even as crude as the episode was, it was still incredibly funny. Not only do you find yourself being grossed out and laughing at the same time, but you’ll probably give a second look the next time there’s an iTunes upgrade and you have to deal with the newest user agreement. What was that? This is not a review, this is just a renarration of the plot. A review should tell if something is worth watching. This surely spoils it for anyone who hasn't seen it yet. Gladly I had seen it already.